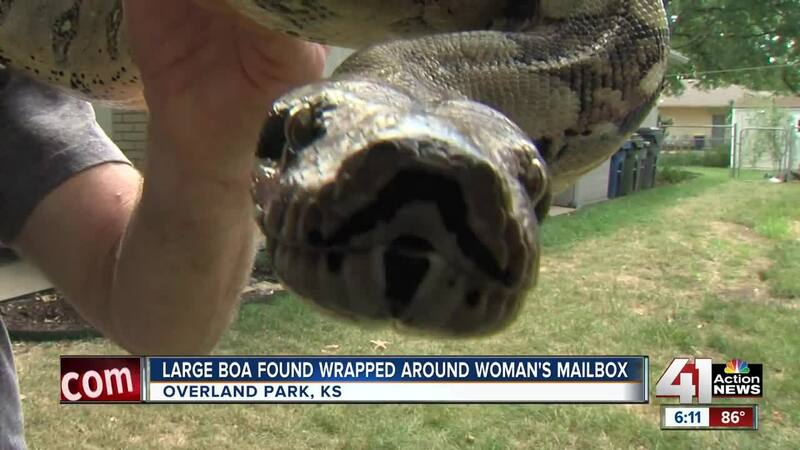 OVERLAND PARK, Kan. — A United States Postal Service worker discovered a massive snake Friday while delivering the mail in Overland Park, Kansas. It's unclear when the red tail boa constrictor slithered onto the home in the Pinehurst neighborhood. "The biggest snake I've ever seen! Looked like it had just had lunch," Holly Gibson, a neighbor said. 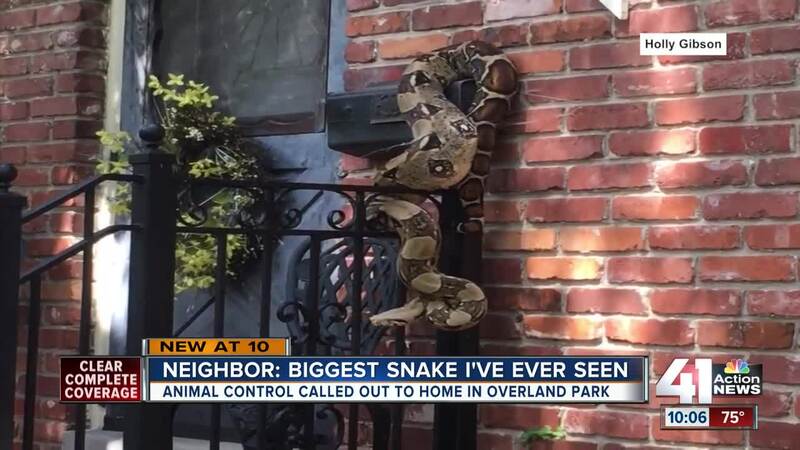 The snake's size didn't make it easy for the responding animal control officer. "It was too big for her to get and put in a box by herself so called in her boss, the police came," Gibson said. Gibson's seven-year-old son, Josh, didn't trust petting the reptile. "I did have a chance but I didn't I didn't want to, I was a little too afraid," he said. The officers were able to wrangle the 20-pound serpent to its temporary home. "They're very docile as you can see," Dr. Larry Holtfrerich, a reptile breeder, told KSHB. "This one here is about six to seven feet, that's about full grown they can get up to 10 feet." Holtfrerich, whose day job is a chiropractor, is now taking care of her. "They're pretty solitary animals, they'll migrate from one place to another a little bit but otherwise they'll pretty much stay in one spot once they find a spot," Holtfrerich said. He believes the well-cared-for boa constrictor is six to seven years old. "They're an easy snake and one of the most common in habitats," Holtfrerich said. It wasn't immediately clear who the boa belonged to, Overland Park police are asking for her owners to come forward. "Her family will be missing her," Holtfrerich said.